For celebrating the Biggest Event of this year, we will have a SPECIAL offer for all of you!!! 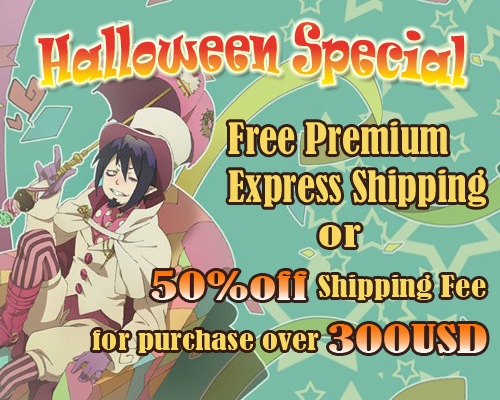 *Any purchases over 300USD, free shipping by Premium Express! *Including : UK, GERMANY, FRANCE, SPAIN, ITALY, NORWAY, FINLAND, SWEDEN, SWITZERLAND, and DENMARK. *Any purchases over 300USD, 50% off discount shipping fee to upgrade your shipping method to Premium Express! 1. Resellers’ accounts cannot enjoy this offer. 2. The amount of ‘purchase’ does not include shipping fee. And the cosplay props items will be shipped separately by Standard Shipping if you order it with other items. Q: When will this offer start & end? A: This offer is available from noon 27th August 2018 to noon 26th October 2018 (Hong Kong Time). Q: Can I use coupon for the order? Q: I’m a reseller, can I get this offer with my reseller account? A: No, this offer will not be available for reseller accounts. If you’d like to enhoy this offer, please log out your reseller account first. Q: If I order the cosplay props with other items, can I enjoy this offer? A: No, since the cosplay props are big & need special protection while international shipping process, so all cosplay props will be shipped out separately by Standard Shipping from other items, so cosplay props cannot enjoy this Halloween Shipping Offer,and Cosplay Props amount is excluded for Halloween offer. Q: Why there are nothing changes for my order? A: Please check your country’s offer from the above Offer Table, and make sure your items price reaches the offer level; if everything is correct, but cannot get the shipping discounts, please contact us at Support Center and let us check for you directly. Q: Can I order with my friends and get this discount? A: We ship 1 order (package) to 1 shipping address only. So, if you buy costumes with your friends, please make sure you put down 1 shipping address only. Q: Can I pay extra shipping cost to split my order into 2 shipping address? A: No, 1 shipping address for 1 order only. Q: I want to order from “Full Cosplay” category. 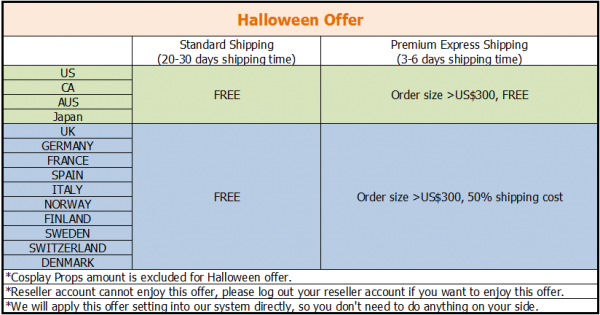 Am I possible to get Halloween shipping Offer? A: Yes, of course! Just shop as normal, and make sure your purchased items price reaches the offer requirements. Q: What can I do if I have further questions?